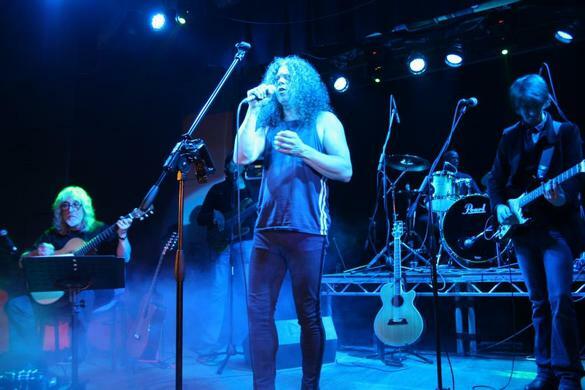 Summers End Festival compared to most throughout the year is really a very small affair, but in terms of commitment by the fans to the music that we fondly call Progressive Rock is a bit special! When Oliver Wakeman asked if I would be up for doing this I was in all honesty quite terrified, for all the reasons I have mentioned many times before i.e. : it being over 30 years since being on stage with a band, and also that fear of looking a bit daft on stage with a bunch of young dudes strutting their stuff. Fortunately Oliver and pretty much everyone else had more faith in me than I had, and thank goodness I bit the bullet and went for it. We only had two days to rehearse what turned out to be a full on two hour show. Fortunately it was a mini triumph and in many ways a small miracle BUT let me say here and now that good performances don't happen by accident! This concert took weeks and weeks and hour upon hour of preparation from all involved and probably more time was put in by me because of my age and the old memory scenario not being as good as it was! So when all six members of the band hit the stage it really all came together pretty well because of the aforementioned ingredients. I can't begin to tell you the long hours that Hilary coped with my practise regime, and bloody self-doubt! Within a few minutes I was totally into it, and was in many ways reminded of how good it can be to be on stage with an amazing rhythm section and great players generally. I shan't give a blow by blow account of the day because this has been brilliantly done by others who will be mentioned elsewhere on this page. I am a great one for giving credit where it's deserved. Without the talent and vision of Oliver Wakeman, much connected with the whole Ravens and Lullabies package would not have happened. Let us go back in time to our first meeting and later listening to the joint material put forward for the album. I would have never in my wildest dreams have thought of this being a song based album, but Oliver certainly did. The whole of the albums concept/ theme whatever you want to call it came from Wakeman the younger, and it was he who found the amazing artwork and then brought his artistic skills to the table and created the albums artwork, photos script...everything. 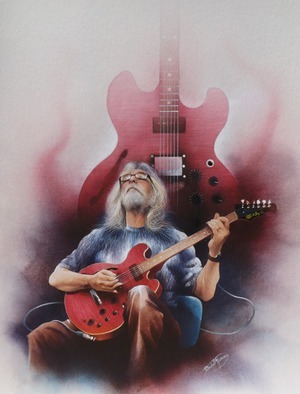 One important ( for me) aspects of his talents was his belief and encouragement for getting me to just "blow away" freely on the electric guitar thus creating soaring solos that I didn't think I was capable of! As you are reading this you must be thinking, well what has a Gordon brought to the table? Well, let us look at the material shall we.
' Moneyfacturing' grew out of a riff I sent to Oliver under the title of "ideas", Oliver then turned this riff into the fully blown song it is today. 'Anyone can Fly' was a complete instrumental from me which was originally called 'Mercurial' and was written for friends. Oliver took the piece and edited it into one of my favourite songs on the album, when the track builds into the final soaring section at the end. That idea came from something I wrote ages ago as a commissioned piece for a finance company. Oliver heard it, liked it and the whole piece worked perfectly. 'Maybe Tomorrow' was a 12 string riff that I sent through to Ol, and within a couple of days he had created this lovely song. And so it goes on. The point I'm making is without one element happening, the other elements can't interact and come together. This album and indeed this duo is truly a joint affair, but without Oliver's rock sensibilities and thorough understanding of the genre, none of it would have got off the ground. I owe him a lot. He even secured the recording contract with the wonderful Cherry Red label! OK, let’s get back to the festival. As the day was drawing nearer I think Oliver knew that in order to really do justice to the first full performance of Ravens and Lullabies we needed to recruit the services of another guitarist, and that person was Nick Kendall, a fine player by any standards, and it was a thrill for me to hear this man replicate exactly all my electric lines from the album, and without him being there it would have seriously limited what I was doing on the acoustic. When I received the text asking if I'd be up for learning a gig's worth of prog rock songs in 2 days, all it took was seeing the names Oliver Wakeman & Gordon Giltrap for me to respond with a big yes! in an instant. I was surprised at just how quickly the songs sunk into my memory, which just goes to show that when it's a style of music you love and relate to, it isn't very hard to learn at all. I had a lot of fun learning Gordon's solos off the Ravens & Lullabies album, and felt honoured to have the opportunity to help bring the album to life with the full band at the Summer's End Festival. Working with Oliver and Gordon was an absolute joy, and during rehearsals I had to make sure I didn't forget my own parts while getting caught up watching the two of them do their thing! There's something really special about a rhythm section that's been playing together for many years, and having Steve Anderson and Johanne James of Threshold on bass and kit respectively, thundering away, was just brilliant! With an album of so much light and shade, Paul Manzi's vocals fit the bill perfectly with his sensitive vocal at one end of the table to his raucous rock scream at the other. For the first gig as a band and with very little rehearsal, I think the Ravens & Lullabies set in Lydney was a success, and hopefully won't be the last! Karl Groom from Threshold, who had produced the Ravens and Lullabies album, had asked me if I’d like to do the Summer’s End show with Gordon and Oliver. I’m a big acoustic guitar fan and after hearing Gordon’s fantastic playing on the Ravens material, there was no doubt that I was up for doing the show ! I knew that Johanne James had recorded drums on the album and was also going to do the show. Johanne and myself have been sharing the stage together in Threshold for the last ten years and so I was quite confident that we could provide a comfortable rhythm section for Gordon and Oliver and make the music groove nicely. I’d had quite a busy summer with Threshold playing festivals and so was looking forward to having some space to sit down and get the Ravens and Lullabies material under my fingers. Steve Amadeo, the original bass player on the album has a wonderful feel and melodic choice of notes, and so it was a real pleasure to work out some of his lines. Oliver was very thorough at organising everything and supplying all the musical material and charts to everyone. He’d added some more songs from his and Gordon’s back catalogue, so a Summer’s End full band set was definitely in the making! I was looking forward to the rehearsals very much and to finally meeting Oliver and Gordon, as we’d only had prior email contact. As expected, they were both great guys and fantastic players! It was also a pleasure to meet Nick Kendall, an extremely talented guitarist, who had stepped in at the last minute to cover Gordon’s electric guitar parts, and Paul Manzi our front man for the show. After our two-day rehearsal I felt we all bonded extremely well and I had no doubt that it was going to be a great show and a memorable experience; it was like we’d been playing together for years! A week later, and the show was upon us, and I must say I was getting very excited about performing with the guys. 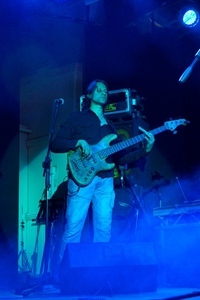 I’d spent time during the week fine tuning the set and practicing vocal harmonies for some of the songs, as I rarely sing and play bass nowadays, and finally felt ready enough to hit the stage for a show. The sun was shinning and I had a pleasant drive down to Lydney Town Hall, meeting Johanne along the way. Johanne and I had played the Summer’s End Festival with Threshold, a couple of times previously, as well as it’s sister festival, Fused, back in 2011, and so I had a good idea about what to expect on the day in terms of festival goers, organization, sound, stage and backstage. When we arrived at the venue, we could hear the festival was in full swing. We headed in, picked up our passes and made our way backstage. There’s a small room backstage and also a large space beneath the stage that we could use. As the sun was shinning, I headed back outside, whilst Johanne stayed behind to warm up. Soon I met Oliver, Gordon, Paul and Nick outside the venue. Everyone seemed very relaxed and happy. Soon it was time to load in, between bands. I met Stephen Lambe, the festival promoter at the side door, who furnished us with meal and drinks tickets. We had lots of help getting the gear in from Mike Stranks and others, which was much appreciated. We were scheduled to set up and sound check around 5pm and start the show around 6:45pm, but the event was over running a bit and I was aware we needed to get a move on. Soon it was time to set up and suddenly the audience disappeared to give us some time to sound check. Nick Worms, the Summer’s End sound man, is so easy to work with and had us all up and running in no time. At this point everything happened very quickly and before I knew it we had all changed into our stage outfits and were standing on stage getting ready to start the show. Suddenly the side doors to the venue opened and the audience came flooding back in. It was wonderful to see lots of delighted eager faces ready to experience the Ravens and Lullabies band. We started the first full band set with Moneyfacturing and I could feel, as always, that Johanne had raised his playing even higher to performance level, with clean crisp chops and tightness – that felt very nice indeed and I knew then this was going to be a fun show! The sound was quite balanced on stage and I could hear everyone well enough to interact nicely. I had a great time playing the first set and soon it was time for Gordon to go on and do his solo piece followed by duets with Oliver. Johanne, Nick and myself took the opportunity to briefly head out into the venue to grab a bite and have a listen to the front of house sound. I really enjoyed Gordon’s solo looping piece, which I hadn’t heard before; the man is truly gifted! Soon we all returned back on stage, nicely warmed up for the final full band set and before I knew it we were playing Heartsong, the encore for the evening, and then taking a bow to tumultuous applause and an array of happy faces. After the show I could see Oliver and Gordon were full of glee, as were we all, which told me the evening had been a great success. Mission accomplished!! 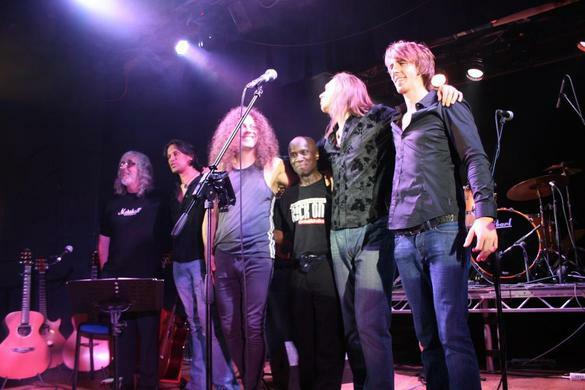 So, to sum up the event - Summer’s End with Gordon Giltrap and Oliver Wakeman- a truly warm and cosy experience. What a privilege to share the stage with such a fantastically talented bunch of guys! I know there were a few tears from friends in the audience when the final notes of 'Heartsong' had faded away, and to have Hilary there to witness what once was a young guy in the late 70's doing his stuff with a rock band at major packed out venues throughout the UK must have been intriguing for her, but she said that she loved it in spite of the volume which with her sensitive hearing has always been a problem, but bless her she truly entered into the spirit of it all, and without her constant support none of what I try to do would happen! So it has come and gone, and in the grand scheme it was but a small thing, but for all the friends and musicians who were part of it, it was a big day for us. 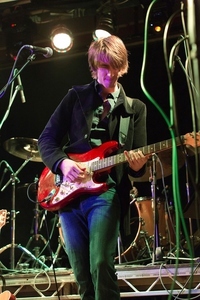 Jon Downes from Gonzo weekly chats to Oliver about the Ravens and Lullabies show and his time with Yes. We all know in our hearts that this music and this album deserves far more exposure and a FAR larger audience than what it has right now, and as I write this Oliver and I are on occasion playing to pitifully small audiences, but of course it in no way reflects on the performances and our gratitude to those faithful few who come to the shows. What can one do, but just keep on keeping on! My heartfelt thanks go to the following people for creating a good memory of that day. Hilary, Oliver, Paul, Johanne, Steve, Nick, Mike Stranks, Sue, Mike, Piotr, Alessandro, Danila, Nicky, Cath, Geoff, Tim, Claire, Steve, Phil, Jerry Ewins and all at CRS. James writes:" I wrote a review of the Ravens & Lullabies set at Summer's End and thought you might be interested in reading an outsider's view of what turned out to be a wonderful set." We came back in to the hall to be greeted by a phalanx of the same t-shirt. It was not the Shineback t-shirt which had been so wonderfully prevalent up to now, but rather was a t-shirt from a 2005 gig by Gordon Giltrap with the Sheffield Philharmonic Orchestra in the Symphony Hall…Birmingham. 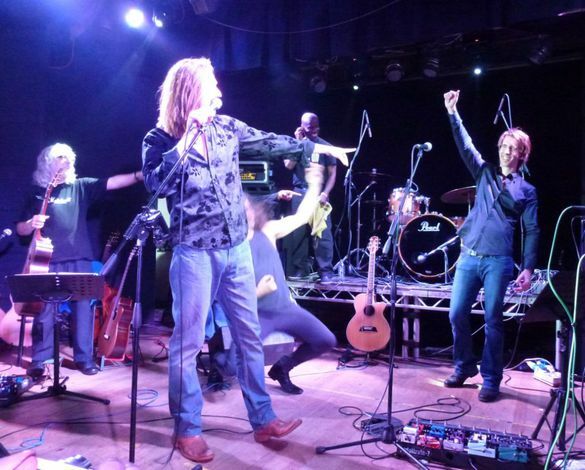 So, that could only mean one thing – a whole group of people had turned up especially for the next act - Gordon Giltrap & Oliver Wakeman, billed as Ravens and Lullabies. I should probably make the point that I do not have that album or anything by either artiste, which meant this whole set was entirely unfamiliar to me. So this review should be fun. It is worth pointing out that although they are not coming on last, this is the headline act for the Saturday and they have a two hour slot. They kick things off with' Moneyfacturing', a rocking, upbeat start, an electric band with Gordon Giltrap on acoustic guitar. The whole band sound so together that it is very hard to believe this is the first gig for them, and just goes to show the level of their talent that they have brought it together so very well. Everyone else leaves the stage as Gordon plays a solo instrumental piece from 1981, called 'The Dodo’s Dream', and he is using a looping station for this. He starts with the opening to 'Stairway To Heaven' then goes into the track on his electric guitar, and it was fabulous. 'Anyone Can Fly' from the Ravens and Lullabies album was written by Oliver for his baby daughter, and he says of Gordon, “this should allow you to better hear some of the acoustic expertise from his 40 year career,” to which Gordon replies, “Thank you. This really is care in the community, being up on stage with these young guys.” It rolls along upbeat and really does allow Gordon to show off his virtuosity. They close with' I Don’t Believe In Angels', which rocks away with the crowd clapping along and takes us to a storming finish. “Do you want us to walk off or just stay ?” asks Oliver, before he introduces the band again. And it is a special encore because they play the full album version of' Heartsong' which has not been done for over 30 years and Gordon dedicates it to his wife Hilary. I do not know the song as such, but it sounds very familiar, and after this set I feel like a lot of what I have heard should become more familiar to me. I must admit I did not know what to expect and they have delivered something very enjoyable indeed. An enthusiastic audience greeted the Ravens and Lullabies Band very warmly indeed as they took the stage. Gordon was probably reassured to see the massed ranks of Giltrapites right at the front of the audience area - no seats here - all sporting their Giltrap tee-shirts. From where I was at the side of the stage I could hear the enthusiastic applause, whoops, shouts and sheer appreciation of a crowd that not only remembered Gordon from his Giltrap Band days and the magnificent three albums from that period, but also responded very warmly to the present band and the new material. Of course, any reference to, or playing of, material from that era brought the house down! Being so close to the band two key things struck me: Firstly, the sheer professionalism and musical chops of them all. Considering that this was in many ways a 'scratch' band with very limited rehearsal time their tightness and delivery was astounding. You'd have thought they'd being playing together for years. Secondly, the sheer respect - and indeed affection - they showed to Gordon. Here were people clearly very accomplished in their own spheres who recognised not only the heritage in which they'd been invited to share, but also someone who can still cut-it with the best of them after almost 40 years in the business. I knew instinctively what the encore would be... a full, album-length, version of Heartsong. To hear the full band version with all the old arrangements we all know and love so well with some tasteful new additions brought a glisten to the eye and a lump to the throat of this old codger who's seen and heard so many bands over the years. There was Gordon very much in the driving seat powering the whole band through this iconic piece. Thank you Gordon for the pleasure and delight you've brought to so many with your music - not just last night, but for 40 years. I woke up this morning and was not sure: did it really happen or was it just a beautiful dream?! My camera helped me: films and pictures from Cirencester and then from Lydney: so I was not dreaming. Gordon and Oliver have a gift of bringing together wonderful people both on stage and in the audience. The musicians (that they are clearly great is no secret - just name the bands Arena, Threshold and think of West End musical) created atmosphere full of passion and played a fantastic concert. After the concert it was a shear joy to talk to them. Let me say it again: On stage there were superb musical talents, God bless them for giving us so much joy! And the fans: what a wonderful group - thank you for such a warm welcome and a truly unforgettable atmosphere you created. I will never forget the people I met and the great music I heard. How could someone in my conditions explain what a 35 years' waiting to see, listen to and mainly KNOW and share words, time, laughs and hugs with one of the most beloved musical heroes EVER? Which words could effectively describe the planet (basically close to Earth, sure, but parallel to it) I was living in those incomparable moments? I must have behaved like a child, that's for sure... but do not children have the gift of sincerity in getting excited and thrilled? So that's how I felt! Words, smiles, hands beating in-time and off-time, no matter when, have been what was lacking to make the picture of an absolutely fantastic music, which until now has been the main witness of the existence of such a great and incredible man such as Gordon (as I knew Hilary I found out one of the sources of the secret of his loveliness..), perfect!! The concert has been perfectly balanced, between "rocking" and moments of poetry, I didn't catch every comments and introducing of the songs but I felt that there were sheer sympathy and humour among the musicians, which made the gig more appreciable than ever. Now the picture needs only the refreshing, year by year, as soon I'll be able to, and no doubt I will be there!! 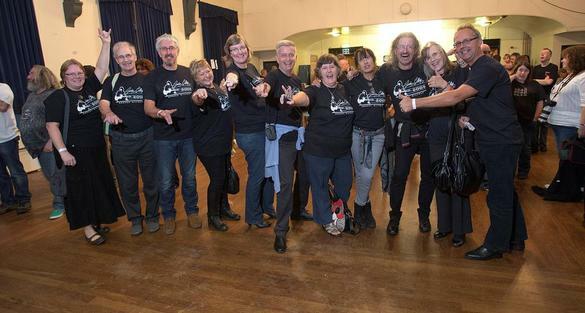 The picture above shows a group of very happy Giltrap fans in their T shirts after the gig. What a fabulous night it was at Lydney Town Hall last night. 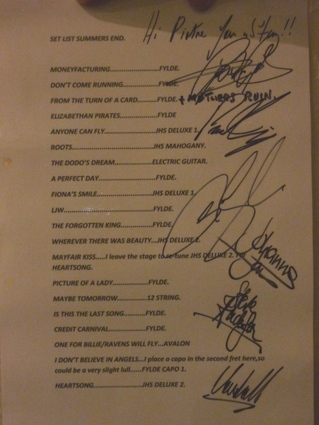 The show was superb, everyone played and sang their hearts out and Gordon as usual was first class. I loved every minute of it and came away with a real buzz - I'm sure everyone else did also as the Town Hall audience clapped and cheered at every song. Newly Announced trio gig ! On December 3rd I have been asked to play at London’s Festival Hall. This is to celebrate the life of my old friend Bert Jansch. I shall be performing the piece "Loren" the tune I wrote in memory of his lovely wife. As yet the final line up is being finalised so I haven’t a clue as to who else will be there apart from Ralph McTell, Wizz Jones, Martin Simpson, Pentangle and no doubt many more. Needless to say I am deeply touched to have been invited to be a part of this special evening. As you all know by now, the David Finney portrait is complete and limited edition prints are available as well as the greetings cards. 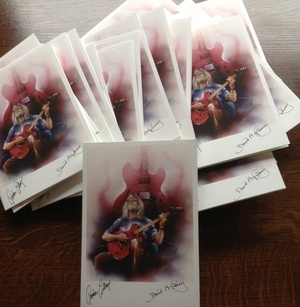 Cards signed by David and Gordon are 7" x 5" and are £5 each, with 10% donated to Musicians Benevolent Fund. Please contact the artist direct at dave@davidfinney.com for more information. This month’s instrument is a bit different and a bit special! 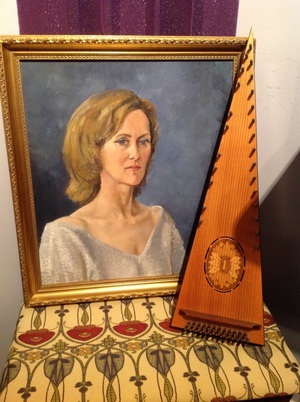 This beautiful handmade Bowed Psaltery belongs to my wife Hilary, and was played by her on a few tracks on A Midnight Clear, my album of Christmas Carols from years ago. This lovely portrait of her was painted by the late Peter Pritchard who I dedicated Wherever There Was Beauty to from the Raven and Lullabies album. Hilary was never that taken with the painting and so it hangs in my music room. I think it is a lovely study of her as I'm sure you will all agree. She doesn't know that I'm featuring it here in this month’s News, and will probably tell me off for doing so.... bless her!